Losing your teeth will instantly change the appearance of your smile. What used to look like a healthy, complete smile can quickly become unattractive without your natural teeth. You will be surprised at how dramatic the change is when it comes to your smile’s appearance, as soon as tooth loss occurs. As soon as you lose your teeth, there is another change that affects your mouth and can have long-term effects on your appearance and health; this change is bone deterioration. Bone deterioration is caused by the loss of tooth roots, which are lost when natural teeth go missing. The role of tooth roots is to stimulate the jawbone to maintain its healthy structure. When the tooth roots are lost, there is nothing to continue that stimulation – and the jawbone will slowly deteriorate. The jawbone will eventually become thinner, and other complications may arise if this condition is not addressed early on. A thinner jawbone results to the shrunken mouth look usually associated with toothless individuals, and makes a person look much older and unhealthy. Bone deterioration can be prevented or stopped from progressing with the help of dental implants. 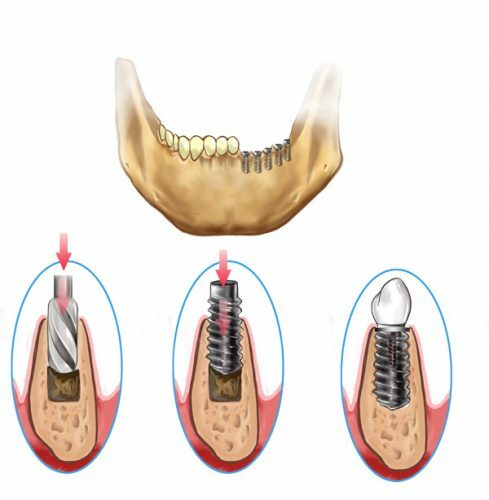 The implants take on the responsibility of the lost tooth roots, and continue to stimulate the jawbone to retain its healthy condition. An implant treatment right after the loss of natural teeth can prevent the occurrence of jawbone thinning, so that adverse aesthetic and functional changes will not affect your smile.